especially if it is different to my own. I will try and publish all material received. During 2000 I visited these working trolleybus museums and subsequently populated the site with the pictures taken at each. The menu to the left will take you to the appropriate pages. You may wish to go to these museums yourself, so a few personal comments on each may help you to decide which to visit if you have a limited amount of time, or budget. All of the museum sites lack any kind of publicity that goes beyond enthusiasts' circles but this site gives full details of where they are located. Only The Black Country Living Museum actively seeks visitors written comments on their enjoyment at the museum, but in the absence of any regular survey of visitor experience, problems remain hidden causing untold public relations damage. I am personally drawn to the conclusion that any visit to these museums is best scheduled on one of their Special Opening days, as there will be very much more to see and enjoy. Even so the Black Country Living Museum at Dudley does provide more of a family visitor experience all the time with their varied attractions that includes an excellent canal trip; the delights of an old fashioned Fish & Chip Shop and a Pub with real ale in the pumps and genuine sawdust on the floor. This more than makes up for the quite disappointing trolleybus riding [wire wiping] that has unnecessarily long dwell times at each stop. Power supply problems prohibit more than one trolleybus moving around the site at any one time. Dudley's overhead wiring lacks any interesting aspects, you won't see a 'conductor' operating a frog for example, but a very relaxed fare collection system operates with most passengers willingly paying the 20p fare. The bookshop stock is not extensive, despite excellent facilities, but this will probably be fully utilised in the future. Everyone at the Museum was found to be friendly, and you feel most welcomed throughout the site. The free car parking facilities are on a surfaced area that is external to the museum. It has good, clean, toilet facilities. Over at The Trolleybus Museum at Sandtoft, its remote location is easily found by the excellent road signage. A free, half hourly, bus service from Doncaster railway station only operates on special opening days. Car parking arrangements within the museum required the use of a very uneven 'corn field', although it was nice to be able to return to the car for whatever reason. The Museum has plenty of trolleybus movements, with many vehicles operating simultaneously, 'wire wiping' the very interesting overhead. The hub of these 'services' is not complimented with a decent 'mileage' to traverse although there is plenty of land for an extensions in the future. Refreshment facilities on special event day[s] were first class with a beer tent, burger and ice cream vans, probably even more choice available for other food stalls. What would be available on normal opening days remains a question as there appeared to be no permanent refreshment rooms. Sandtoft's special opening days attract a considerable number of enthusiasts' stalls that sell a broad range of transport related items out of the depot area, but sadly the interior lighting makes it difficult to see some of the goods on offer. Surprisingly for the '2000 Gathering', the Souvenir Programme failed to list the exhibitors in this Enthusiasts' Market. It would have been all too easy to miss this element of the event. 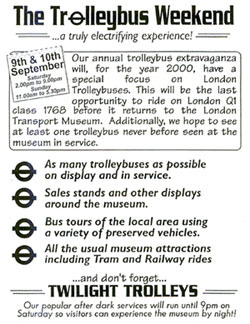 Special event days have an extensive preserved vehicle display showing trolleybuses [non-operational], buses and cars, all of which are most interesting not least of all being London trolleybus #1812 which is almost restored to its former glory. The toilet facilities at Sandtoft require serious upgrading and enlargement. There have been some high hopes for extending operations at Sandtoft, the original extension plan [running up the runway to the potato shed] were dropped. This was because of problems of running rights over someone else's land; the future of such could be awkward and therefore not in the best interests of the Museum. A later plan was developed involving the land behind the site [i.e. far end from the road] and extending through the back gate, but turning LEFT instead of bearing RIGHT. This would pass a new purpose-built exhibition centre. Ultimately, the plan was to loop round and come out several hundred yards back down the main road. The extension would therefore be all on Sandtoft's land. However, despite the farmer's verbal agreement to sell the land at a reasonable price, he changed his mind and now wants virtually double. This has hence fallen foul of our lottery bid, as the HLF will not fund exorbitant or profiteering prices for anything bought with lottery money. Sandtoft are still negotiating with the farmer, but have not made a breakthrough to the deadlock. Preserved trolleybuses are occasionally dragged from one museum to another, but to be absolutely certain of being able to ride upon, and see, a London trolleybuses, then it is necessary to visit the East Anglia Transport Museum just outside Lowestoft. This Museum advertises more special event days than any other trolleybus museum although, judging from my experiences of "The Trolleybus Weekend", it was difficult to see what extra effort was being made, other than an evening twilight trolleybus service. Certainly I, and around a dozen other potential visitors arriving in the morning, was surprised to find the Museum not opening until 2pm. Despite many travelling in excess of 150 miles for their visit, no concessions were offered, even though the site was teeming with numerous 'helpers'. While others left for other attractions in the area [some not to be seen again], I found it possible, but frustrating, to observe activities from outside the perimeter fence and actually got some fine photographs in the long wait leading up to opening time. From the unkempt gravel free car park, access to the Museum is through what feels like the tradesmen's entrance where an adapted garden shed collects your entrance fee; you then have the delights of what the Museum has to offer. The advertised special focus on London trolleybuses never really materialised, with even the exciting prospect of the chance to ride upon a London tramcar again not possible due to an electrical fault. Trying to photograph this tram and a London trolleybus together with the 'correct' combination of blinds proved to be an impossible dream. Despite encouraging notices on the depot door to be involved in preservation activities, those present were more intent on the project in hand than to break off to speak to, or help, visitors. #1521 remained hidden at the rear of the depot, masked by safety barriers and a simple request to remove these for a few moments to take a picture was refused. Operating 'slots' for the Museum's trolleybuses left #1768 with an appearance late in the afternoon, thus missing the good strong midday sunshine that so improves photographs. To ride or photograph #1768 was a tricky decision for the rest of the day, with neither being possible in the future. [This trolleybus was returning to the London Transport Museum after the event]. In between times, a quick visit was made to the sales stands, but there were few visiting exhibitors. Staying on for the 'Twilight Trolleys', I was very surprised to find the refreshment rooms inexplicably closed for an hour break at the end of the afternoon, thus denying the pleasure of a mug of tea and a toasted sandwich. For this hour all vehicle movements also seemed to grind to a halt - it was just as well I had a flask of coffee in the car. The ensuing night service of trolleybuses was great to watch. With the combination of tram and trolleybus services the overhead was quite interesting and included a traversing triangle, which even on the vast London system was only found in three places. The drumming on the roof from the trolley booms was more noticeable at this Museum than either at Sandtoft or Dudley. The road layout of the Museum, and the installed overhead, restricts the number of trolleybuses on the move, so the planned extensions, regrettably on hold, would greatly enhance the visitor experience. I found that toilet facilities catered for the disabled, with the entire ablutions being quite acceptable.